Shares of the Chinese used car specialist plunged on an underwhelming earnings report and rising macro concerns. Shares of Uxin (NASDAQ:UXIN) tumbled again last month as investors continue to back away from Chinese stocks and after Uxin's third-quarter earnings report wasn't enough to impress. As a result, shares of the Chinese online used car platform fell 40% during November, according to data from S&P Global Market Intelligence. 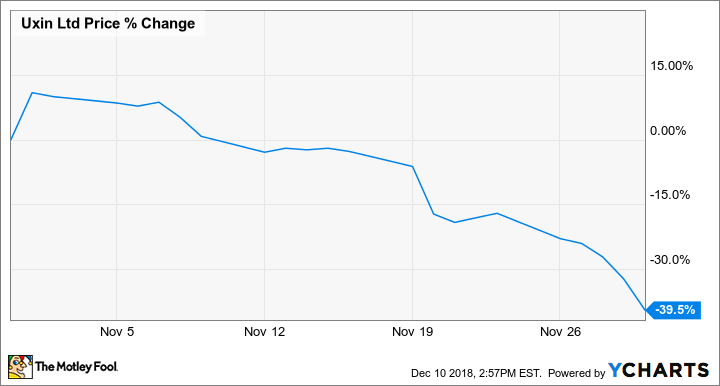 As you can see from the chart below, the stock fell in almost every session of the month, diving in particular on Nov. 20 when its earnings report came out. November presented more of the same problems Uxin has faced since it debuted on the public market in June, as the stock has gotten swept up in concerns on trade tensions with China and news that the Chinese economy and auto market is slowing. Coming into November, the stock was already down more than a third since its IPO at $9, but the sell-off accelerated last month, largely after its third-quarter earnings report. Uxin, which is China's leading online used car platform, delivered another round of strong growth, but the results seemed to disappoint investors as shares fell 12% on the news. Uxin delivered revenue growth of 59.6% to $125.5 million, with growth in its consumer-focused segment especially strong as loan facilitation revenue, its biggest category, nearly doubled to $68.8 million. However, that strong top-line growth still represented a marked slowdown from 80% growth in the second quarter. Uxin's costs also surged in the quarter as the company continued to spend aggressively on sales and marketing to drive top-line growth. As a result, its adjusted net loss in the quarter widened from $56.7 million to $75.2 million, reaching -$0.09 on a per-share basis. CEO Kun Dai called the performance strong and said, "Our relentless focus on providing a broad selection of cars, digital transparency and a one-stop solution continued to translate into outstanding user experience and growing demand for our services from both consumers and dealers." Toward of the end of the month, the stock fell sharply on renewed trade concerns with the U.S. after a "truce" seemed to fall through and Huawei's CFO was arrested. The company projected revenue of $146.9 million to $152.7 million for the fourth quarter, or just 38.6% growth, though that may be a result of a strategic shift in its dealer-focused business that is resulting in slower revenue growth. In the first week of December, Uxin shares surged on news of a partnership with Taobao, one of Alibaba's e-commerce sites. The stock nearly doubled over a three-day span after the announcement as a short squeeze seemed to help drive the momentum. Given the company's aggressive growth, uncertainty with the Chinese economy, and the impact of short-sellers, the stock should continue to be volatile in the coming months.